The popular online children’s game site, Poptropica was named one of Time magazine’s top 50 websites of 2011 andcelebrated its fourth birthday this month. The site, created by, among others, Diary of a Wimpy Kid author Jeff Kinney, allows children to explore an imaginary world divided into islands. 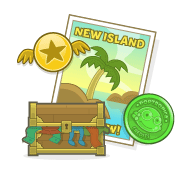 Since its launch in 2007, Poptropica has been launched 20 distinct “islands,” ranging from Steamworks Island to Wild West Island to Wimpy Island. The site has attrated over 75 million registered users worldwide; some 10 million kids visit each month. “We’ve been thinking of books from Poptropica from the get-go,” said Brallier. It seems that with such an established fan based, moving into books should be an all-but-guaranteed success.